1st State BIKES: Are the best investments on-road or off-road? By Steve Clark, April 19, 2012 -- In surveys of attitudes toward bicycling as transportation, there often is a large group of people who are "interested but concerned," usually about safety. I'm hearing lately that some feel we need more off-road bike paths to get these people on bikes. I've also heard that a local bicycle organization is supporting a proposal to put in a "sidepath" along a fairly busy street with lots of intersections. Bike lanes or bike paths? What's going to get more people riding? What's safer? What is the better investment, on-street or off-street? This last question of course, was a critical one for Bike Walk Twin Cities when we began implementation of the Non-motorized Transportation Pilot Program back in 2006. Congress made it clear that these funds were to get people out of their cars - to see "to what extent walking and bicycling could become part of the transportation solution." So we knew we had to make sure that whatever we built, it would help people reach their destinations, safely and efficiently. The facilities needed to be seen as part of a transportation network, not just a nice recreational loop around a lake. 1) Bike paths, with few exceptions are not bike paths. They are multi-user trails (aka MUTs) accommodating skaters, walkers, people in chairs, baby strollers and skate boarders. When well-designed, these are hugely popular and relatively safe. 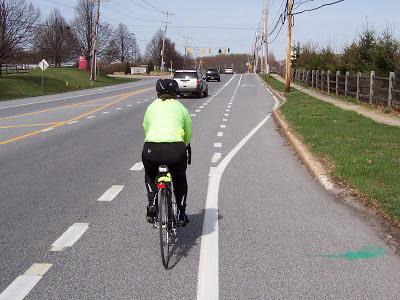 When narrow or in areas where there are lots of intersections or driveways, bicyclists often choose to use the adjacent roadway, where they tend to fare better in terms of safety and travel time. Poster's note: Trails and pathways are never going to connect everyone from doorstep to destination, especially in the U.S. Even the most bike-friendly places in the world have on-road accommodations high in the list of priorities. This is kind of a false argument. The US is almost completely devoid of bike facilities, on or off road. Cycle tracks or protected bike lanes are not multi-use sidepaths, they are distinct from the sidewalk and with good design can mitigate hazards in conflict zones like intersections. Typically in major cities when enhanced bike facilities are carved out of a traffic lane bike traffic doubles and motor vehicle crashes are reduced by about 30%. The best solution is a connected low stress network that uses bike blvds, navigational signage, bike lanes, cycle tracks, ubiquitous bike parking, urban bike sharing and yes multi-use paths.